Fedor Emelianenko is aware of the dangers he’s facing when he shares the Bellator cage with Ryan Bader. Emelianenko will meet Bader in the finals of the Bellator Heavyweight World Grand Prix. “The Last Emperor” earned his spot in the finals with finishes over Frank Mir and Chael Sonnen. As for Bader, his knockout victory over Muhammed “King Mo” Lawal and his decision win over Matt Mitrione got him to this point. Emelianenko vs. Bader goes down on Jan. 26. Bellator 214 was also supposed to feature a middleweight title bout between champion Gegard Mousasi and Rafael Lovato Jr. Mousasi was forced to pull out due to an injury. Lovato Jr. was later pulled from the card as well. MMA News will provide live coverage of Bellator 214. Be sure to join us for live results, highlights, and post-fight tidbits. 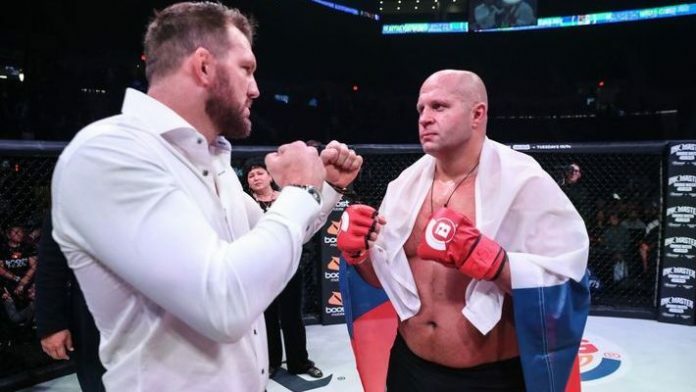 Any chance Fedor Emelianenko becomes the new Bellator heavyweight champion?